After many months of feeling something wasn’t right with my abdomen, I went to my doctor just before Christmas 2006. I could feel a swelling in my abdomen, and, yes, the doctor could feel it too. After taking pregnancy test under the doctor’s instruction, I was sent for an ultrasound where they found a huge cyst on an ovary. My next appointment was for a CA-125 blood test and to see a gynaecologist. On the 23rd January 2007 I got a telephone call from the gynaecologist saying my CA-125 test came back elevated and I would be admitted to hospital on Sunday 28th January ready for surgery on the 29th. Monday came and I was ready for my op, 3 hours later back I came expecting to be told “the operation went well we have removed the cyst”. This was not the case, I had to have a hysterectomy and my appendix removed because there was something else wrong. “You have mucus in your abdomen, but don’t worry it’s not cancer but we will send you to The Christie in Manchester where they deal with this type of thing”, I was told. 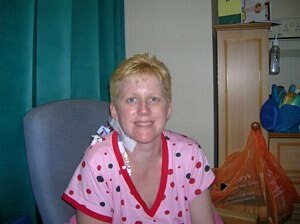 I was discharged from hospital on 2nd February 2007 knowing there was something inside me but not what. Thinking I hadn’t got cancer and a Macmillan nurse visiting me did make me question what I had been told at the hospital. But I tried to not let it play on my mind. A week after a letter came from The Christie saying I needed to have a CT scan before they can see me, in the letter was the information I needed, a diagnosis, pseudomyxoma peritonei (PMP). At last a name! I could look it up on the internet. The first thing I found out was that it is cancer and a very rare one too, only one in a million people a year get it. I received my CT scan and the results are at The Christie, they had a meeting on the 19th March 2007 to discuss my case. I then went up a week later to find out the outcome. After many tests I underwent an operation on 10th September 2007. The op went very well, they removed my spleen, gallbladder, omentum, a small amount of colon and all the mucin. They also did a hot chemo wash to make sure they got every last bit. After 2 weeks in hospital I was discharged and continued to recover in the comfort of my own home. I continue to have follow ups at The Christie with blood test, CT scans and consultations from the specialist. All was progressing well with results coming back all clear, the anxiety and anticipation of having the check ups have never changed. In January 2009, I took a turn for the worse suffering intestinal blockage which meant enduring further surgery to eliminate the problem. The cause of the blockage was adhesions from earlier operations. I was on the road to recovery again but had been advised that it may not be a long-term fix. Due to the previous operations, it was pretty certain that I would suffer from side effects of the adhesions in the future also. I still have the all clear from the cancer but unfortunately due to the continual pain from the adhesions the reminder of everything that I have gone through is there every day. I am thankful to all the doctors, nurses, family, friends and fellow PMPers for all their help and support. Hi, my name is Suzanne Zimmerman and I’m a ten year survivor of Appendix Cancer/PMP/Mucinous adenocarcinoma. I was given 3 months to live ten years ago. I’ve had the debulking and heated chemotherapy. Over the years I’ve had partial bowel blockages and ALOT of adhesions in my peritoneal cavity which have lead to many days of extreme pain. I live my life on a day by day basis. I can be ok one minute then be crying in pain 15 minutes later. It’s frustrating to have something so internal, that when people look at me they may think , ” Well she LOOKS fine”, and I’m not. So, I enjoy the good moments ​and lean on God for everything else.